Easily accessible, our 1-star Hotel Première Classe de Carcassonne, is a 10 minute walk from Carcassonne Aiprot and near the Deux-Mers highway (exit 23 off highway A61) in the artisanal zone of La Bouriette. 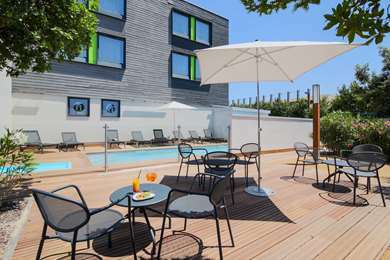 Hotel Première Classe de Carcassonne is conveniently located so you can easily get to the Narbonne Gate of the Medieval City of Carcassonne and the Canal du Midi, that are classified as UNESCO World Heritage sites. Ideally located 3 miles from the city center, the Medieval city and the SNCF train station, our Hotel Première Classe benefits from a great location in Cathar country. All our rooms have a flat-screen cable TV, as well as private shower cubicle with sink and toilet. Some rooms have overhead bunks and can therefore accommodate a third person at no extra charge For your business trips you will have free Wi-Fi connection and a desk in your room. To get the best rates, reserve your hotel online or using the HotelForYou app available on Smartphone (Android or iPhone device). Our 73 rooms offer optimal conditions for a comfortable, pleasant and efficient stay. They can accommodate 1, 2 or 3 people either in a large bed or in single beds. All our rooms are equipped with a flat-screen TV, air conditioning, free Wi-Fi connection, a desk, integrated alarm clock and a private shower cubicle with sink and toilet. We have two specially adapted rooms for people with reduced mobility. For only €5, recharge your batteries with the all-you-can-eat breakfast buffet at Hotel Première Classe Carcassonne. Served from 6:30 am to 10:00 am weekdays, and 7:00 am to 10:00 am weekends and holidays. Breakfast is half price for your children under age 10. -Distributors of confectionery, cakes, cookies, cold and hot beverages available. Nice clean, comfortable room, just enough for 48 hours. It is amazing how simple necessities are combined with cleanliness and one gets a feeling of luxury even if it is in terms of basics only. The computer requires a 200 character mark response so seems like I need to go on and on - why don't you apply the sense of simplicity to the reviews here and stop reminding that one has to write more than one likes to say? We booked for a late night arrival and early departure. Did the job, not well, but ok. Thank you for taking the time to give an opinion on our hotel. The rooms are warm. The place is cheap. The bed comfortable. There was hair on the sheets but nothing major. The rooms are small but they do for sleeping and stopping over in. The bathroom is very small, however the shower was powerful and very hot. There's a desk and chair as well as a TV. The vending machine is available 24/7 and serves pretty decent coffee and lovely hot chocolate as well as snacks (chocolate bars, biscuits, juice, water, crisps). Cleaners are in every day and give you fresh towels ever day. There's a bus service number 7 not too far from the hotel only €1 per person to carcassonne centre. There's a shopping centre over the highway (not too noisy) a McDonald's and KFC as well as a large shop and a lidl nearby. Takes a 20minute walk from the airport and 45minute walk to carcassonne centre if you fancy walking it. Value for money was perfect for us didn't expect much so we were pleased. I thank you for taking the time to write us your opinion. We are happy to know that your stay in our hotel was pleasant. I will share with all the team your satisfaction. A room for the night! Arrived late at night on route to Spain with three children aged 11, 13 and 14 we needed two rooms and their prices made this reasonable. Yes decor is worn and dated as well as rooms being completely functional with staying a night so at 30 euros a night (maybe an extra 5) where else are you going to get this? Room was clean had a tardis like shower and toilet in the room but we got in easily late at night and left at our leisure in the morning. No frills not expensive room for the night! Thank you for leaving us a comment following your stay at our property. We make every effort to satisfy our guests and are happy to know that your stay has gone well. We arrived here for a one night stay in carcasonne on the way back from our holidays in the south of France. We should have guessed by the price that it was going to be very bad but nothing would prepare us for this horrific experience. Firstly the room resembled a dungeon or a prison cell and had concrete walls wit limited lighting. The room had a bunk bed wit three beds. The top bed was about one foot from the ceiling which only added to the stifling claustrophobic feeling. Secondly the bathroom resembled a portacabin in size and material with one towel provided even tho there were three in our party. However the worst was yet to come when we bedded down for the night. My sister was awoken from her sleep by a cockroach crawling across her face. We then realised that the beds were alive with roaches which had been crawling all over us while we slept. Clearly distressed, we vacated the room immediately and had to sleep in our car. I have never experienced anything like this in my life. Don't ever, ever stay here, utterly disgusting.